via Muhammad Shahid on twitter. No one knows exactly when Lahore Fort was built but it was first mentioned around 1021 AD when Mahmud of Ghazna conquered it. Over the centuries Lahore was conquered many times. 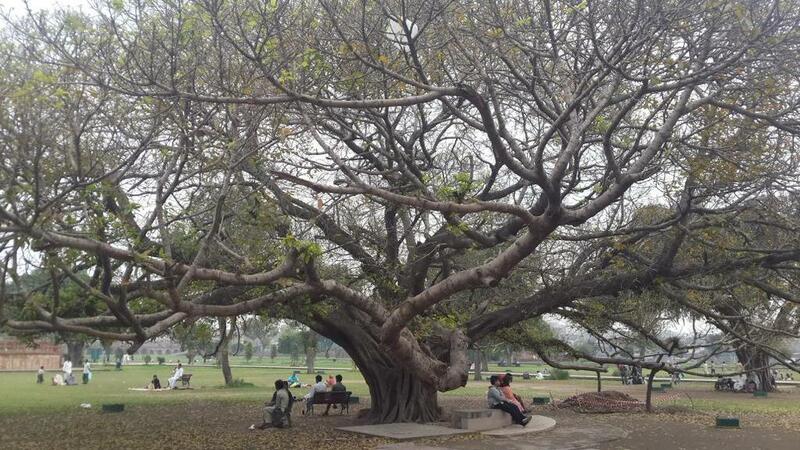 Lahore has also been an important city for a long time. 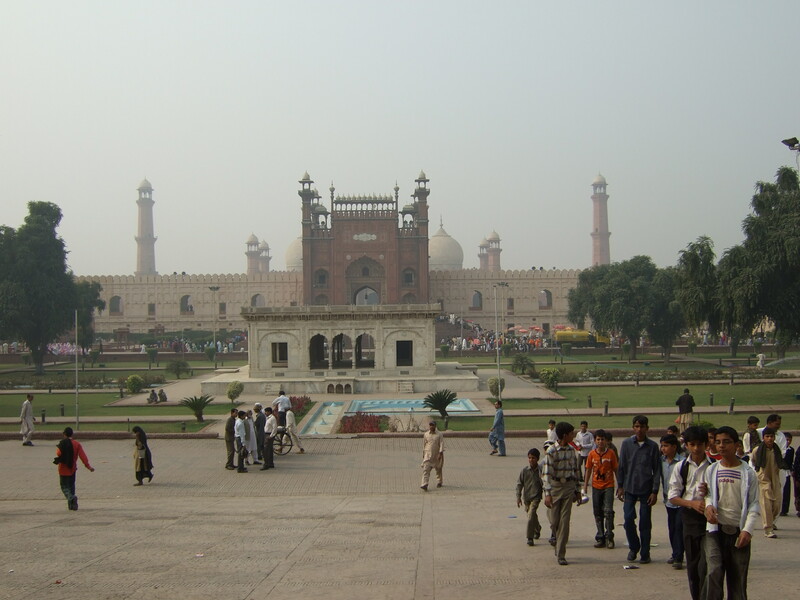 The best time for Lahore was during the Mughal reign from 1525 to 1721. Jalal-ud-Din Muhammad Akbar (Akbar the Great) built the present structure as we know it today. Jahangir and Shah Jahan constructed palaces in the Fort and Emperor Auranzeb Alamgir built the Badshahi Mosque which is opposite the Alamgiri Gate of the Fort. This is the huge entrance which has two large pillars which resemble elephants feet. I visited in November 2008 and at this time of the year the weather is very pleasant. As a result, hundreds of school children go on visits to museums and monuments. Not only schoolchildren but families too. During this time there was a Sikh gathering at the Gurdwara which is next to the Fort and Mosque and there were many Sikhs visiting too. US ambassador Anne W. Patterson has stressed the need to protect shared cultural heritage. She paid a visit to the Lahore Fort to mark the completion of Alamgiri Gate, another US-funded conservation project. 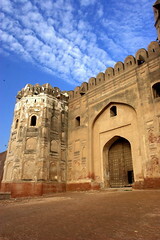 The Lahore Fort, locally known as Shahi Qila, is located in the northwestern corner of Lahore’s Walled City. The majestic edifice is the result of many centuries’ work. According to the Pakistani historian Wali Ullah Khan, the earliest reference to the Fort comes in the history of Lahur (Lahore) compiled by Al-Biruni, which refers to a fort constructed in the early 11th century. Munshi Sujan Rae Bhandar, author of the Khulasa-tut-Tawarikh records that Malik Ayaz, a lieutenant of Sultan Mahmud, built a masonry fort at Lahore and inhabited the city. It is generally believed that present Lahore Fort is the same fort, which was damaged by the Mongols in 1241 and again in 1398 by a detachment of Timur’s army, then rebuilt in 1421 by Sayyid, son of Khizr Khan. LAHORE: Recent permission for parking outside the Punjab Archaeology Department (PAD), adjacent to the Lahore Fort gate near the Samadhi Maharanjit Singh, has damaged one of the Fort’s painted walls due to the emission of smoke from the parked vehicles, sources told Daily Times on Monday. According to government statistics, the parking stand, adjacent to the Shershah Wali plot, was once a beautiful garden under the Parking and Housing Authority. The decorations are between two cornices, which are divided into a double row of differently-sized arched recesses. The fresco paintings are carried out in the arched recesses, while the spandrels are tastefully decorated with tile mosaics, displaying men, fairies, elephants, lions, dragons, scenes of animal fights, men playing polo, and numerous other games. The human figures on the wall give evidence of the fashion custom of that time, from the clothing worn by royalty to those of servants and gladiators. Sources said that even though the parking stand was constructed for visitors and employees of the Fort, the coaches of the Badami Bagh bus stand are also utilising the space. They said that the smoke emitted from the vehicle engines were directly damaging the wall and ruining its beauty. PAD Director Muhammad Shahbaz, when questioned about the environmental pollution, defended the parking stand by saying it was a necessary requirement for the visitors of the Lahore Fort. He urged the removal of the GT Road to save historical monuments, adding that even though the GT Road and the parking stand are at a considerable distance, the stand should not be abolished. NGO Eco Watch Trust President Imran Haider, who five years ago filed a case in the Environmental Tribunal (ET) about environmental hazards to monuments, said that the ET had passed a judgment regarding the parking stands near monuments to be prohibited. He said that his appeal was to preserve the monuments in general, claiming the parking stand to be the worst form of threat to the wall, adding that it should be restored back to being a mini-garden. An Environmental Protection Agency (EPA) spokesman told Daily Times that the EPA would ask the Environment Department of the City District Government Lahore (CDGL) to submit a report about the parking stand. He said that he would ask the CDGL to take action against the PAD for not saving the monuments from the hazardous effect of the vehicles. He said that the EPA, seven years ago, had suggested the provincial government to remove the Badami Bagh Bus stand in order to protect the Lahore Fort from the smoke and dust of the buses. He said removal of the bus stand would help protect the Fort. Sheesh Mahal (Palace of Mirrors) at the Shahi Qila, Lahore, Pakistan – April 2008, originally uploaded by saffyhuk. The picture shows the Sheesh Mahal (Palace of Mirrors) at the Shahi Qila, Lahore, Pakistan.. The Lahore Fort, also known as Shahi Qila, is located in the northwestern corner of Lahore’s Walled City. The majestic edifice is the result of many centuries’ work. According to the Pakistani historian Wali Ullah Khan, the earliest reference to the Fort comes in the history of Lahur (Lahore) compiled by Al-Biruni, which refers to a fort constructed in the early 11th century. Munshi Sujan Rae Bhandar, author of the Khulasa-tut-Tawarikh records that Malik Ayaz, a lieutenant of Sultan Mahmud, built a masonry fort at Lahore and inhabited the city. 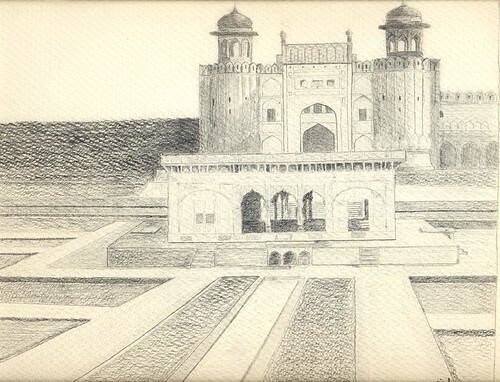 It is generally believed that present Lahore Fort is the same fort, which was damaged by the Mongols in 1241 and again in 1398 by a detachment of Timur’s army, then rebuilt in 1421 by Sayyid, son of Khizr Khan. The Fort was extensively refurbished, extended and upgraded during the Mughal era. This is why it is rightly attributed as one of the gems of the Mughal civilization. Emperor Jalal ud Did Akbar, Jahangir, Shah Jahan, and Aurangzeb all added to it. During the period of Sikh occupation, Ranjit Singh added several pavilions on the upper ramparts. Some modifications to the Fort were made during the British period beginning in 1846 for housing facilities for colonial functions. Those modifications have been reverted and efforts made to bring the Fort back in its pre 1846 appearance.